My recent enthusiasm for moving my backside and getting fit has resulted in a truth becoming obvious: I need to replace my sneakers. After a few minutes on the treadmill it becomes clear that while they once supported my arches, they no longer do so, and besides, I've worn holes in the heels. It seems that recently, barefoot or minimalist shoe have become fashionable in certain circles of the fitness world. Experiments on my own have led me to believe that for my particular foot and body geometry it's probably a good idea to at least thoroughly explore this alternative. So, yesterday I hopped on a tube and then a tube and then my first ever London bus and then I walked to buy myself my very first pair of Vibram FiveFingers. So why exactly have I gone from one extreme to the other? It's pretty obvious that's exactly what's happened. I have gone from sneakers that are rigid, have huge amounts of cushioning, correction, and support - to what are basically, thin gloves with a tough layer. Let's start with my biggest problem - pronation. My ankles fall in. Both of them. Quite significantly. So that's a major problem my shoes need to correct for. 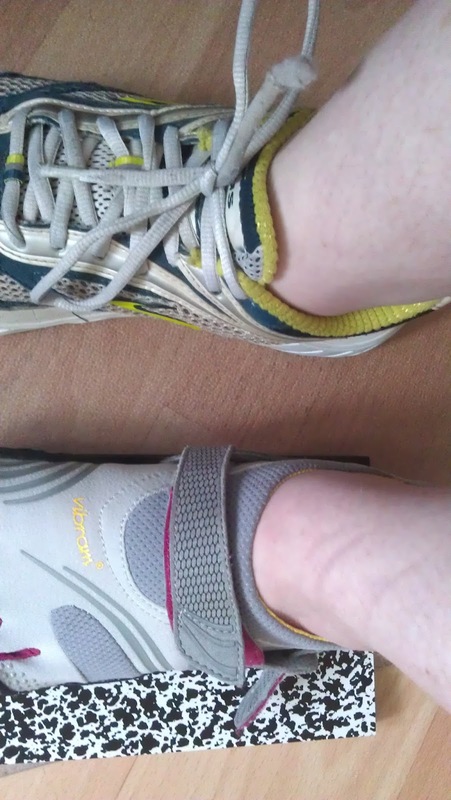 Here's a picture of my feet side by side (my left foot is on a book to adjust for the difference in height). 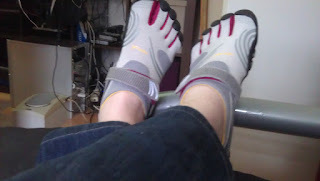 Oddly, it seems that in terms of correction ... the fivefingers are better, or at the very least, equivalent. Despite not having anything there to do the correction with. That's a wee bit weird - until you consider the shape of the thing. I have crazy narrow feet. An AA fitting, I've been told. Most women's sports shoes come in a C fitting - even finding ones that are a B fitting is challenging. My old sneakers are about a B fitting, so even though the shoe itself has all this wonderful reinforcement - my ankle has heaps of room to move because the shoe is simply far too wide. 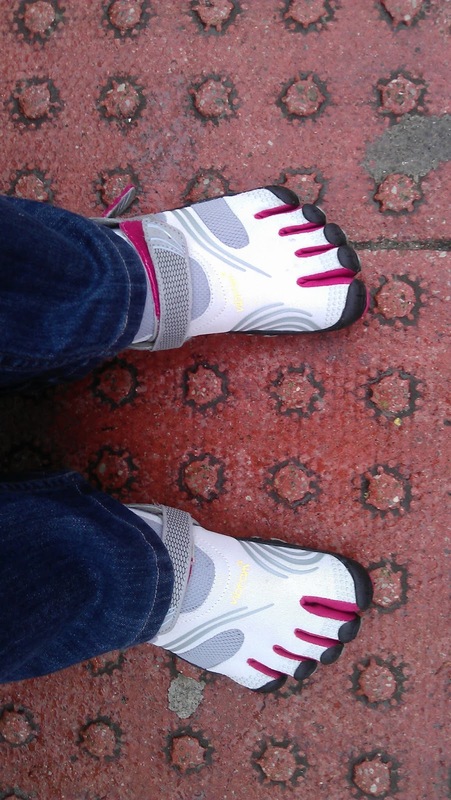 On the other hand, the fivefingers are adjustable to even my narrow feet - even people with narrower feet than mine would easily be able to adjust them to fit. This moves on to arch support. Surely the sneakers come out better? Well, maybe when they were new. Now, because my ankle isn't kept true, over the time I've been using them the arch support in the foot has been stomped sufficiently flat that I can't rely on the shoes to put my weight where it ought to be (on the outside of my foot) and instead it goes straight down the inside unless I'm paying very strict attention. Again the fivefingers come out well ahead here, because there's nothing to stomp flat. It's already mostly flat. Not only that, my foot's neutral position in the shoe channels my weight to the outer edge of my foot. My last major problem is impact while running - or any movement, really. Surely the sneakers will come out ahead here. Impact changes depending on which part of the foot strikes the surface first. I experimented with this in my sneakers a bit. It turns out that heel striking jars me all the way up to my jaw. I feel it, and it is uncomfortable to start, rising to painful. Toe striking is much more comfortable. The problem is - to toe strike in my sneakers I have to really think about every single footfall. That's not so much of a problem when I'm walking along at 6kph. When I'm running at 9kph or sprinting at 11kph, on the other hand, it gets significantly more challenging. Doing some tests while trying the fivefingers on, I naturally toe strike at anything much above an amble. I can heel strike if I really want to. I don't want to usually. Of course, it's not all sunshine and rainbows. The first time I put on a pair of fivefingers, it took me a good half hour to get them on. These are not time friendly to try on (today, it took me a good 30secs - or about the same time as normal shoes and socks). Finding a stockist who actually has a full range (or close to) so you can find one that actually suits your foot is quite challenging - there seems to be rather larger demand than supply at present. And not every style will suit every foot - I chose Komodo Sports, because of the styles I tried on, they suited my foot best. None of the LS shoes fit correctly - of course, they're made more for people with a high instep and wider foot, so that's not a surprise. I'm not at all happy with the colour, but well, they'll do as a sneaker replacement. Until I get my second pair. The other downside is that if you're used to your shoes supporting your feet, it'll take you 4-6 weeks to adjust fully to the fivefingers, so their website says. I expect it to take somewhat less time for me, since whilst I haven't been doing much in the way of running barefoot, I have gone for bare or socked feet most of the time the last couple of years. The adjustment is mostly learning to use muscles in your feet that have atrophied. They'll also change the way you stand and walk, which will affect your hips, back and neck - positively in the long term, but as with any such adjustment, it may not be comfortable to begin with. If your feet are too distorted by wearing years of punishing shoes they also may take a very long time to get used to, since they force the foot into a more natural shape - toes separated, no heel elevation, emphasis on the pad of the foot. They also have a very distinct prejudice against having second and third toes longer than a big toe, although roughly equal length is accommodated. Lastly, these are not for everyone. It does take a certain level of self confidence to wear them in public - less so now that they are becoming more common, but they are distinctive. Colours are limited - I'd prefer a plain black, personally, but the best I can do with this model (when I find a stockist who has them) is black, grey, and gold. They feel like going barefoot - even I, the intrepid I-don't-care-what-other-people-think-of-my-clothes person, felt somewhat undressed wearing them in public. And I need to find a pair of socks. Knee high ones. Because my ankles and lower legs get cold. Yes, I am a wuss. We all know this. Personally, I think I'm sold on them. 18, Stay a while, and listen. Should my blog grow up? 13, with links to many photographs!